One of the exciting and brand-new developments that has taken place as part of the Made in Korea project is the creation of a mobile phone app. This is Joseph Young’s doing so he gets all the credit for this! Joseph has been working with app developer echoes.xyz over the past 18 months on another commission and it has been eye-opening to see what he has achieved with this. He is the digital expert in The Ceramic House team, which, when mixed with my very much hand-made approach to working with clay, is why we think the mix of craft and digital, or more specifically ceramics and sound, is so innovative and pioneering as an ongoing exploration. 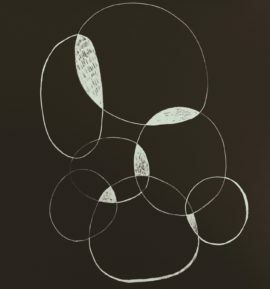 Celadonaphonic uncovers the links between sound and ceramic practice through a GPS-triggered sound walk that uses ceramic making processes as its source sounds, and features compositions from six international sound artists and composers, curated by Joseph in partnership with Hankil Ryu. 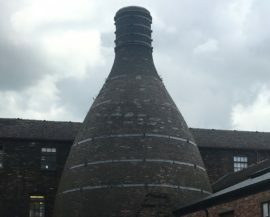 The app was inaugurated at British Ceramics Biennial in Stoke-on-Trent in September and will also be launched at Mullae Arts Factory, Seoul, in November, where the Made in Korea project ends. 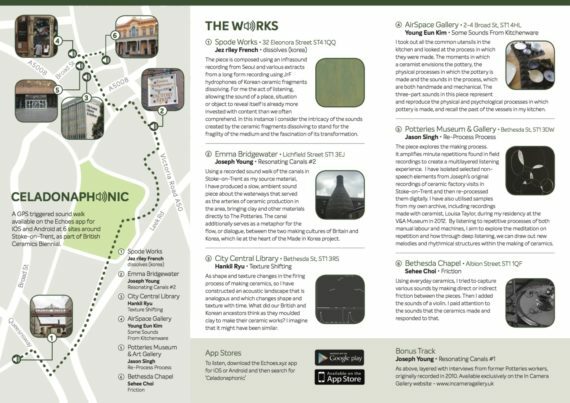 The mobile app that hosts the soundwalk can be found at echoes.xyz and is available for both iOS and Android. Download the echoes app and search for Celadonaphonic. You can also listen to the sounds directly on the app (without being in situ where the sounds are geographically located). It is recommended to wear a good set of headphones. 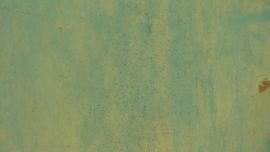 The commissioned artists are listed here with the names of their sound works. 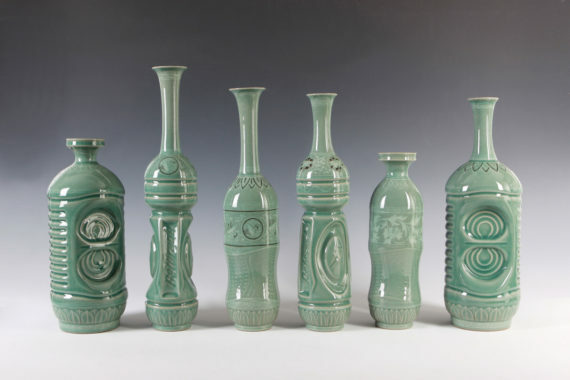 All of the sound artists are accomplished in their field, and have taken the ceramics theme on board and come up with astonishing results. 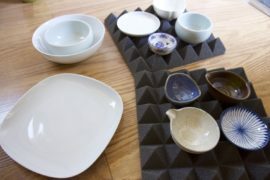 For example, Young Eun Kim lives in Los Angeles and has used tableware she brought from Korea to make all the sounds. 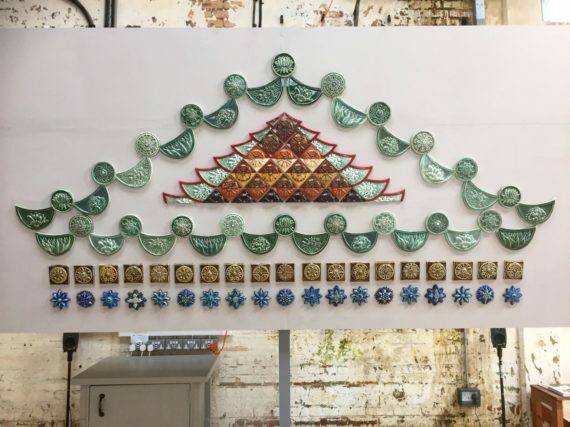 Jez riley French did a great live performance of his piece ‘dissolves – Korea’ in our space at Spode Works, where he dissolved unfired clay together with his daughter Pheobe riley Law, a budding sound artist. Please listen! All of these sound works form the soundtrack for the documentary film that is currently being made about the project. 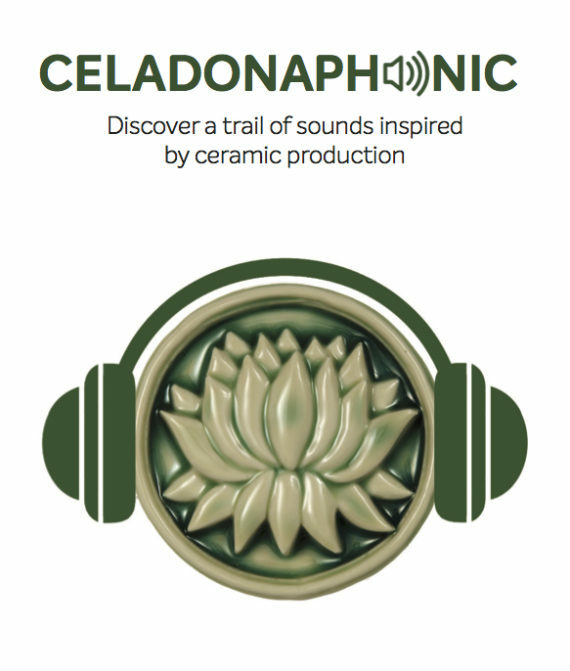 If you go to Spode Works you can not only hear one of the sound works on Celadonaphonic, you can also experience Joseph’s sound installation in the Made in Korea installation, Handmade Automation. When I travelled to Korea in October 2016 in receipt of my AIDF Arts Council grant, Joseph lent me a hand-held sound recorder. In visiting the 10 Seoul-based artists who participated in the Made in Korea exhibitions at The Ceramic House and Sladmore Contemporary, I recorded the sounds of them working in their studios – scraping, thumping, throwing, grinding and using machinery. Joseph used these sounds to create one half his sound piece for British Ceramics Biennial, ‘Handmade Automation’ – the ‘Handmade’ half is a two-channel work that emanates from my Korean inspired piece Pavilion. The ‘Automation’ half is composed of sounds recorded in Johnsons Tile Factory, which appropriately emanates from Won and Jin’s Wedgwood-inspired piece Shadow Workers.